SHENZHEN, China (AP) — Maria Sharapova and top-ranked Simona Halep opened their 2018 seasons with straight sets wins on Monday at the Shenzhen Open. 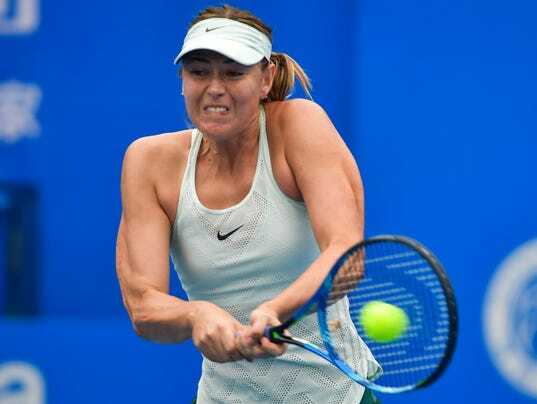 Sharapova finished off a 6-3, 6-0 win over Mihaela Buzarnescu with a powerful forehand winner, and Halep started her bid for a second Shenzhen title with a 6-4, 6-1 victory over Nicole Gibbs. “It’s my first victory this year as No. 1 in the world, so I’m just happy and enjoying the time,” said 2015 champion Halep, who will play China’s Duan Yingying in the next round. Sharapova dropped an early service game but recovered quickly to dominate her match. “It’s always nice to start off the year with a victory. Overall I thought, besides a few breaks in the beginning, I really stepped up and finished the match off well,” Sharapova said. The five-time major winner will next play 2017 Shenzhen finalist Alison Riske, who opened beat fifth-seeded Wang Qiang on Sunday. Did Kyrie Irving &apos;like&apos; video of LeBron screaming?